My daughter loves to color her favorite Littlest Pet Shop characters. 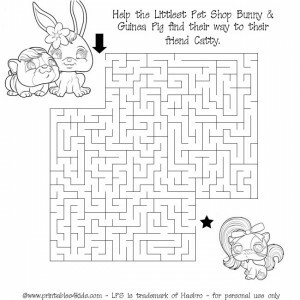 The online coloring activity for Littlest Pet Shop is no longer online so we have made a Littlest Pet Shop maze for you to print, solve and color instead. Click the image to view and print full size. Did you know that Littlest Pet Shop is one of the most popular birthday party themes for girls? hey i really love littlest pet shop and i love animals i like littlest pet shop because i love animals im a animal person! but littlest pet shop are to expensive and i have around 95 or 100 but there way to expensive but oh well i will just stop buying them but the other point is i cant find any littlest pet shop colouring in sheets that you can colour in on the computer and thats Quite a problem. and the littlest pet shops are very very very very cute. Awwwwwwwwwww. Just too cute. But some of them are a bit odd looking! But still cute! littlest pet shop is so cute!!!!!!!! i love littlest pet shop coloring pages!!!!!!!!!!!!!!!!!! i LOVE LITTLEST PET SHOP it ROCKS.